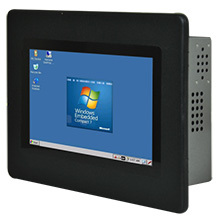 Winmate is introducing an industrial Windows CE 7.0-based Panel PC intended for use as operating system, Human Machine Interface (HMI), or controller. 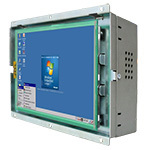 Since control room and HMI applications have a wide range of display size requirements, Winmate offers our Panel PC with screens ranging from 5.7" all the way to 15" with Panel Mount or Open Frame housing. Our Panel PC is built with latest technology such as the 720MHz version of TI Cortex A8 processor, Windows 7.0 and 4-wire resistive touch. The device comes with onboard 512MB DDR memory and 1GB flash storage, four standard USB ports, a RS232/422/485 serial port, and one RJ45 10/100 LAN support PoE function. There is also a single SD Card slot. The device is also designed to meet tough industrial environment requirements for performance, low power consumption in a Panel PC form factor system.